Hand lay-up is the simplest and oldest open molding method of the composite fabrication processes. It is a low volume, labor intensive method suited especially for large components, such as boat hulls. 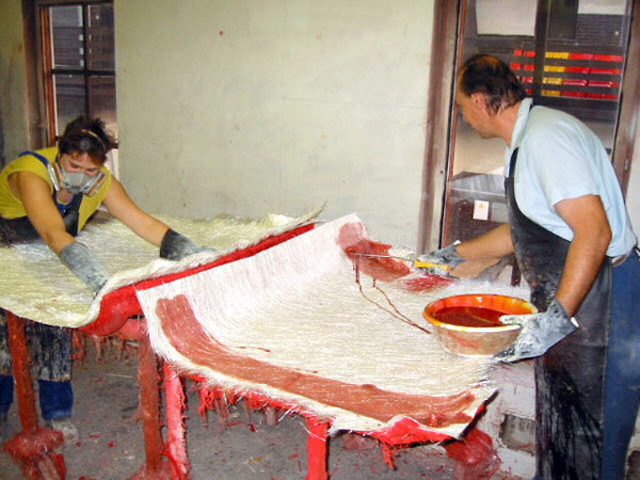 Glass or other reinforcing mat or woven fabric or roving is positioned manually in the open mold, and resin is poured, brushed, or sprayed over and into the glass plies. Entrapped air is removed manually with squeegees or rollers to complete the laminates structure. Room temperature curingpolyesters and epoxies are the most commonly used matrix resins. Curing is initiated by a catalyst in the resin system, which hardens the fiber reinforced resincomposite without external heat. For a high quality part surface, a pigmented gel coat is first applied to the mold surface.